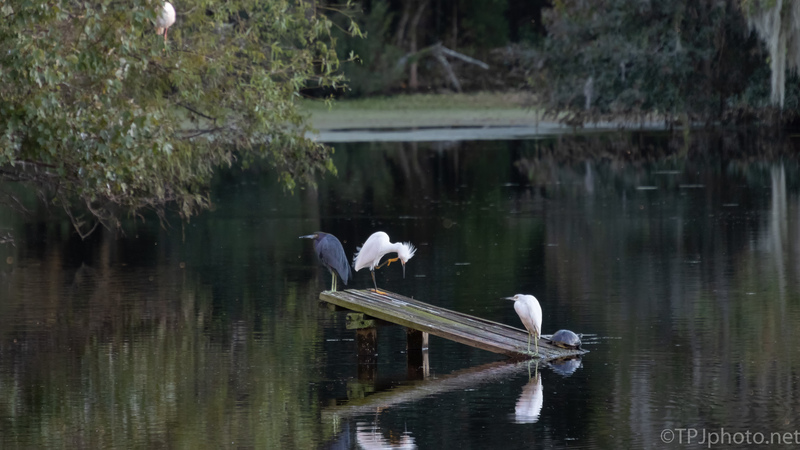 A few birds (and a turtle) settle on an old ramp. The dark bird is a Little Blue Heron, next to him is a Snowy Egret, at the bottom a juvenile Little Blue. What I could not get in this shot, at least clear, is the White Ibis sitting in the tree. And just so we don’t forget… the Red Slider turtle hanging on the edge. Overall, a little bit of everybody closing out the day. There’s something centre-top that looks like a bird-foot and makes me imagine a Jurassic size heron or egret standing in the background and overlooking all the others! I had to go look 😀. A dead tree lying on its side. This swamp/pond is narrow at this end. From this angle you can see into the woods on the other side. It is now fall here and we actually do have some trees that lose leaves.